I have read very few Japanese authors myself. I will give Mishima a go – thanks for an informative review. I love that line: “frothy like sea foam.” What a perfect description! I haven’t read a book by a Japanese author in a very long time, but your description and awe of The Temple of the Golden Pavilion make me want to go check it out as soon as I can. As far as this book goes, I can appreciate the fact that the first book kind of ruined you for the second. This has happened to me before, and often, even though the lesser book is perfectly good, it just really suffered because of the awesomeness of the first. I do hope that your reading of The Sea of Fertility trilogy is an excellent experience for you. When a book by an author blows my socks off, I don’t generally expect their second book I read to be on par. It’s rare to find that kind of magic, even with the same author. I guess it’s better to keep your expectation low, just in case :). I’ve been wanting to read Temple because Claire has been raving about it (now you). Haven’t tried Mishima. I really should. @ Eva: I am really excited to hear your thoughts on Temple when you read it. It’s so very different from this book, that I’ll be really interested to see how you wind up feeling about it. It’s really brilliant, though as I said, it couldn’t be more different from this one! @ rhapsody: Thanks! It really encapsulated the vibe of the book, I think! @ zibilee: This is why sometimes I try to read authors in chronological order so that I can see how they develop over time and also if their stronger books are from later in their careers I don’t feel let-down when exploring their other works… I haven’t had any luck tracking down the Fertility trilogy locally, but hopefully I’ll find some of the books soon! @ mee: You’re right that I should probably not expect authors to be consistently awesome, but I don’t think I’d say this is a bad book, just that it was very different from what I’d come to expect from Mishima. I should probably only expect authors to have one really awesome book and be happy when I find it, but I always find myself hoping the rest of their books will be similarly amazing! I haven’t read anything by this author yet, and you have me intrigued! The Sound of Waves, being the most “frothy,” sounds like it might be a good one to start with. 🙂 Thanks for the recommendation. @ Stephanie: Thanks for commenting! 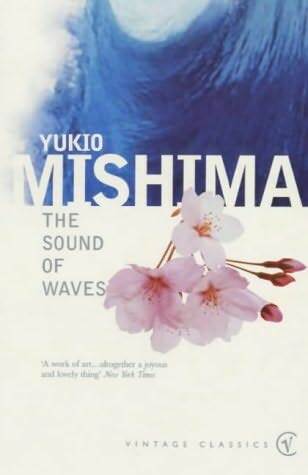 I think this would be a good place to start with Mishima, because it’s not nearly as strenuous a read as Temple of the Golden Pavilion, but still highlights many of Mishima’s strengths as an author. Plus it’s fun! I’m afraid the only thing I know about Mishima is that he committed ritual suicide. And I have my 12th grade English teacher to thank for gory bit of trivia. I really should read one of his books so I have more positive things to day about the guy! @ softdrink: Well, at least your 12th Grade English teach mentioned Mishima, even if it was only about his sticky end! I didn’t find out about him until I was 26! But yes, you absolutely should read something by him! Ooh frothy.. I’m dying to read the Sea of Fertility tetralogy (but waiting for the new Vintage covers, lol). I think I’ll read all of Mishima’s works eventually. We share the love for Temple.. I wasn’t able to say anything much about it as well. It stunned me.